The NHL’s Western Conference playoff race has been run at somewhat of a snail’s pace over the last couple of weeks as nobody’s grabbed the bulls by the horn and taken charge. The Colorado Avalanche are perhaps the one team that has been playing consistent hockey though with a 7-2-1 record in their last 10 games as of March 30th. The Avalanche currently possess the second wild card spot with 85 points and just four games to go in the season. The Dallas Stars hold the first wild card position and should soon lock up a postseason berth with their 88 points. However, the Arizona Coyotes and Minnesota Wild are still in with a shout at catching Colorado, but have gone 3-4-3 and 3-6-1 respectively over their past 10 outings. The Avalanche managed to edge Arizona 3-2 at home in a shootout on March 30th for their second straight win. But with a three-point lead on the Coyotes and a four-point edge on Minnesota it’s going to be a nail-biting finish to the end of the season. Colorado’s last four outings of the season are away to the St. Louis Blues followed by two home contests against the Edmonton Oilers and Winnipeg Jets while they wrap the season up with a trip to the west coast to take on the San Jose Sharks. Arizona hosts Minnesota and the Los Angeles Kings followed by a road trip to meet the Vegas Golden Knights and then finish the campaign with a home game against the Winnipeg Jets. Meanwhile, Minnesota faces the Coyotes in Arizona and then hosts the Winnipeg Jets and Boston Bruins and finish up on the road in Dallas. The key game in the race will be the Coyotes vs Wild clash on March 31st with the Avalanche benefiting since somebody has to drop at least one point. One of the keys to the Avalanche’s late-season run has been 27-year-old goaltender Philipp Grubauer of Rosenheim, Germany. He’s 17-9-4 on the season with a goals-against average of 2.69, a 91.6 save percentage and three shutouts. He’s been there when needed especially with Mikko Rantanen and Gabriel Landeskog missing time with injuries. Grubauer has posted an 8-3-1 record since February with a 96.0 save percentage and 1.35 GAA. He’s also is 6-0-1 in his last seven starts while allowing just 11 goals. 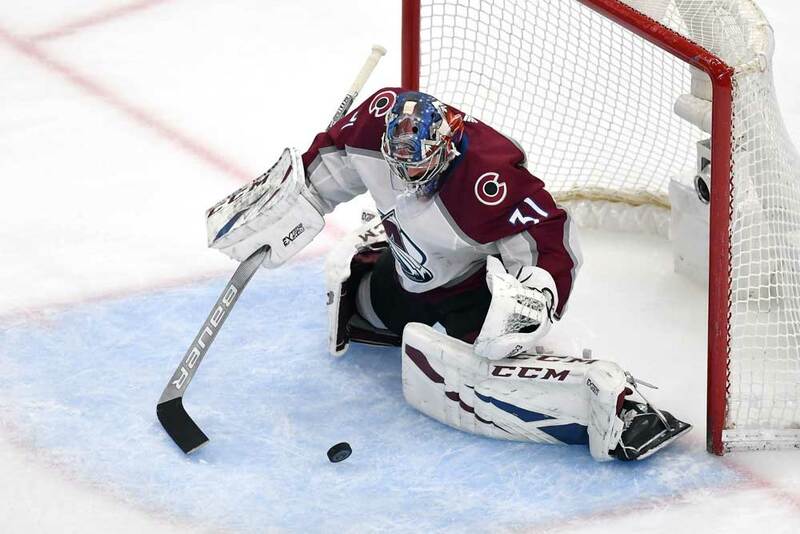 Grubauer, who was acquired along with Brooks Orpik in a trade with the Washington Capitals on NHL draft day last summer for a second-rounder, has been giving the Avalanche a chance to win every night with his play of late. He’s shared the net with Semyon Varlamov this season, but Varlamov is an unrestricted free agent this summer and could be on his way out of town. Grubauer was also a pending free agent when Colorado picked him up and they then signed him to a three-year contract worth a total of $10 million. With the way he’s been playing late this season it looks like the Avalanche may let Varlamov walk and assign the full time starter’s role to Grubauer next year. However, NHL goaltenders have a habit of running hot and cold and this includes Grubauer. He started the 2017/18 playoffs for Washington last season, but was soon replaced by Braden Holtby and the Capitals went on to hoist the Stanley Cup. Grubauer was originally drafted by Washington in the fourth round with the 112th overall pick in 20-10. His career stats read 60-40-15 with a 2.39 GAA and a 92.1 save percentage with nine shutouts. Therefore it could actually be argued that he’s having an off-year in 2018/19 due to a mediocre start to the season. Grubauer’s not going to be able to steal every game for his teammates though and the Avalanche desperately need Rantanen back in the lineup to rejoin Landeskog who just returned against Arizona on March 29th. Landeskog, the team captain, has 33 goals and 70 points with 10 power-play goals and nine game winners, but missed the previous nine games with an upper body injury. Rantanen has chipped in with 31 goals and 87 points with 16 power-play goals and four game winners and has been shelved for the last four games with an upper body injury. The Avalanche has been getting some offensive production from their blue line though with the underrated Tyson Barrie leading the way. The 27-year-old has 12 goals and 44 assists on the season while logging 21:38 minutes of ice time per night. He’s just 5-feet-10-inches tall, weighs 190 lbs and is a minus-5, but he’s offensively gifted and very mobile. Barrie, who hails from Victoria, British Columbia, recently scored the 73rd goal of his NHL career to pass Sandis Ozolinsh as the highest-scoring defenseman in Avalanche history. He racked up 10 points while Landeskog was out to lead the team to help keep Colorado in the thick of the playoff hunt. Barrie’s always had a knack for picking up points as he scored 51 goals and 228 points as a junior with Kelowna of the Western Hockey League and was a two-time all star min the West. He had 64 points in 93 games with Lake Erie of the American Hockey League and has notched 73 goals and 304 points with Colorado since making his debut with the club in 2011/12. He’s never scored more than 14 goals in an NHL campaign as of yet, but has posted seasons of 49, 53, and 57 points and should set a new career high this year with his current total of 56 points. If Grubauer and Barrie can continue their hot streaks the Avalanche should be favored to hold onto the last wild card spot in the West, especially since Landeskog has just returned to the lineup. However, if Rantanen doesn’t return before the postseason faces off, Colorado likely won’t last too long this spring.